Wishing you a joyous holiday season and a bright New Year filled with peace and happiness. From all of us at the National Italian American Foundation: Merry Christmas! ‘Tis the season for food, fun and Christmas karaoke! 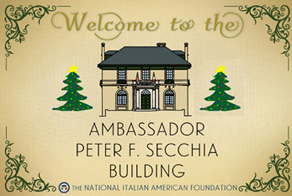 Join NIAF for our Christmas Open House, Wednesday, December 14, beginning at 6 p.m. at NIAF Headquarters at the Ambassador Peter F. Secchia Building, 1860 19th St NW, Washington, D.C. Stop by in festive attire and enjoy light appetizers, drinks, music and the presentation of the future Victoria J. Mastrobuono Museum & Learning Center. You are welcome to bring a guest, however RSVP is required to Andrea Bartlett at abartlett@niaf.org by Friday, December 9. Your name and the name of your guest must be on the list in order to gain entrance to the party. Come celebrate the holiday season with your NIAF family! As the year comes to a close, make your end-of-year giving part of something bigger – give back to the Italian American community and donate to NIAF in our #WeAreNIAF campaign. Your gift allows us to provide scholarships and grants for Italian American students, as well as continue our work in Italian cultural programs throughout the United States and important campaigns such as our Italian American Earthquake Relief Fund. Every donation counts! To learn more about what we do and how you can help, go to www.WeAreNIAF.com. Get your tickets now for our 2017 NIAF New York Gala! 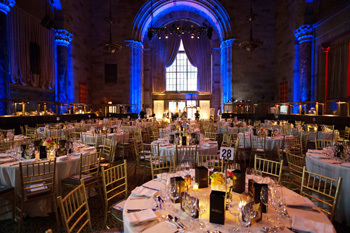 We will be returning to the legendary Cipriani 42nd Street in the heart of the Big Apple on Wednesday, March 22. NIAF Members who register before January 2, 2016 will receive 10% off. For tickets, sponsorship information and more on the event, visit www.niaf.org/nyc or contact Andrea Bartlett at 202-939-3118 or abartlett@niaf.org. NIAF’s Italian American Relief Fund is dedicated to providing relief for the victims affected by the earthquake that struck Central Italy on August 24, 2016, and more recently on October 26 and 30, 2016. All donations, large or small, are welcome and appreciated. While we are working with local Italian authorities to identify a specific project or projects for funding in the coming weeks, we assure you that 100 percent of all proceeds will go to the rebuilding efforts of a community badly damaged by this natural catastrophe. For more information, go to: www.ItalianAmericanRelief.org. Students – apply for the trip of a lifetime! Applications for the 2017 Ambassador Peter F. Secchia Voyage of Discovery are available online at www.niaf.org/voyageofdiscovery. 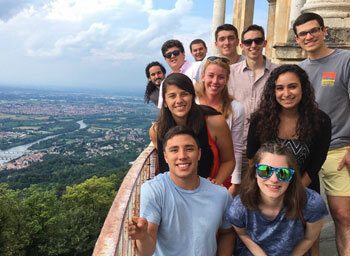 This all-expenses-paid trip to Italy connects young Italian Americans to their heritage through cultural experiences abroad. To be eligible to apply, students must be of Italian heritage, be enrolled in college in the spring of 2017, and have never traveled to Italy before. Applications for NIAF 2017 Scholarships now available! Applications for NIAF scholarships are now open. Scholarships range from $2,500—$12,000 and are awarded to undergraduate, graduate, post-graduate, medical, and legal students. If you are Italian American, or if you are studying Italian in college, Apply today! Deadline is March 1, 2017. For more information, go to www.niaf.org/scholarships or contact Gabriella Mileti, director of Programs, at gmileti@niaf.org or 202-939-3116. This holiday season, shop online at Amazon and support the work of NIAF: Simply, go to http://smile.amazon.com/ch/52-1071723 and select the National Italian American Foundation as your charity of choice and the AmazonSmile Foundation will donate 0.5 percent of the purchase price from your eligible AmazonSmile purchases to NIAF. AmazonSmile offers the same selection and low prices as Amazon and customers can still use their Amazon account, the only difference is customers are now also donating to a great cause! For more information about NIAF and its exciting new benefits, visit www.niaf.org/join. NIAF is proud to announce its new Corporate Sponsors! Take a look at the money-saving discounts and exclusive deals they offer to NIAF Members through the NIAF Membership Portal at www.niaf.org/my-niaf/. Be a part of NIAF’s Facebook community! Check out and “like” (or “love,” “wow”) NIAF’s Italian American pride-studded Facebook page to be a part of our online community! And those of you who already follow us, grazie for your support! NIAF on Facebook is a rapidly growing online community with everything but your Sunday dinner table — news, views, recipes and trivia. Anything Italian, Italian American or NIAF, it’s there! Plus, contests, giveaways, and free tickets to shows, concerts and events across the country! Join us at www.facebook.com/niaf.org. Join NOIAW at The Carltun in East Meadow, N.Y., for the Long Island Annual Holiday Luncheon on December 17, 12-4 p.m. The event includes a gourmet, three-course meal, vendors with holiday gifts, and a chance to mingle with friends. Advance registration required: http://ow.ly/kg7M306G8nt. Join the Greater Washington, D.C. Region of NOIAW on Wednesday, January 11, 2017 at 6:30 pm at Maggiano’s Little Italy for their annual Epiphany Celebration honoring three “Wise Women.” This event will honor the achievements of three noteworthy Italian American women in their professional careers throughout an evening of dinner and cocktails. RSVP required; to register, go to www.noiaw.org/epiphany2017. Are you a Nonna or know a Nonna who would like to be on the Cooking with Nonna online cooking show with Rossella Rago? Show off your cooking skills and your secrets to Italian cuisine! Answer the Cooking with Nonna casting call here: http://ow.ly/V6z9306Gh32. Il Circolo: the Italian Cultural Society will host its 2016 “Natale in Famiglia” Christmas luncheon on December 18, starting at 1 p.m., at the Boca West Country Club in Palm Beach, Fla. The event includes Italian food, live music, and appearances from Babbo Natale and Befana. For more details, click here: http://ow.ly/mB65306G9b0. The Calandra Italian American Institute will host a book presentation of “Branded: How Italian Immigrants Became ‘Enemies’ During World War II,” by Lawrence DiStasi on December 15, 6-8 p.m. This discussion will explore how Italian immigrants in the United States struggled with nationwide suspicion during World War II, affecting the Italian American community as a whole. For more information, go to http://ow.ly/Zfig306G9Fi. 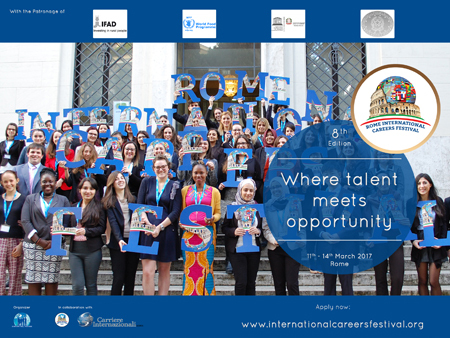 Registration is now open for the International Careers Festival in Rome, Italy, March 11-14, 2017! This event offers students and young professionals the unique opportunity to explore their professional aspirations and to meet with international institutions, companies, NGOs, the media, United Nations representatives, and much more! Deadline to apply: December 16, 2016. For more information, go to www.internationalcareersfestival.org. An exciting and dark comedy film, “Tiramisu for Two,” will premier on December 2 at 7:30 p.m., at Texas State University’s Patti Strickel Harrison Theater Performing Arts Center in San Marcos, TX. The film was produced by Texan Italian Monthly: an initiative to highlight Italian culture in the state of Texas. For more information on the film, go to: www.tiramisufortwo.com. Casa Italiana Zerilli-Marimò will host a film screening of “Habemus Papam [We Have a Pope]” on December 12 at 6 p.m. This comedy-drama explores what goes on behind closed doors during the selection for the next Pope of the Catholic Church, and the screening is part of the NYU Center for Applied Liberal Arts’ Fall 2016 Foreign Film Series–Political Landscapes: A View from Abroad. For more information, go to: http://ow.ly/16Gj306Ge6H. Experience the Italian city of Venice through the camera lens during small, week-long photography workshops this winter. 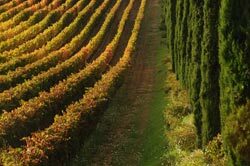 Led by acclaimed husband-and-wife photographers-authors Frank Van Riper and Judith Goodman, these off-season tours allow you the time and opportunity to explore Italian culture and one of the loveliest spots on Earth. Small class sizes assure individual attention from instructors, and first-class accommodations and dining are guaranteed throughout the trip. There are no entrance requirements beyond a love of good food, fine wine and photography! The Venice workshop will take place January 7-13, 2017. For more information and rates, go to www.GVRphoto.com or http://veniceinwinter.com/workshops/. You can also contact GVR Photography directly at GVR@GVRphoto.com. 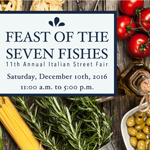 Part of Fairmont, WV’s annual Feast of the Seven Fishes festival December 9-10, the Festival Cucina Cooking School will take place at on December 9, at 6 p.m., at First Presbyterian Church. The class will instruct students on how to cook the authentic and traditional Italian Christmas Eve dinner: the Feast of the Seven Fishes. Tickets are $25. To register or for more information, go to www.mainstreetfairmont.org. Congratulations to NIAF member and longtime friend, Rossella Rago, on the publication of her new cookbook, “Cooking with Nonna.” With carefully-selected recipes from her own Pugliese grandmother (nonna) and the many other nonne she has worked with, Rago’s new cookbook is the perfect addition to any Italian kitchen! And a perfect Christmas gift! The book is available on Amazon.com and Barnes&Noble. CLICK HERE to pre-order your autographed copy! 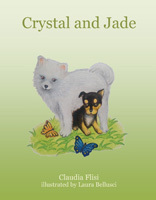 Congratulations to NIAF member Claudia Flisi on the publication of her children’s book, “Crystal and Jade,” illustrated by Laura Bellusci. Based on a true story of the author’s life, this book explores the true meaning of friendship between two dogs and their owners. It is available on Amazon.com. 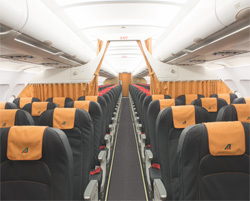 Connecting on an Alitalia flight upon arrival to Rome? Experience our new Medium Haul Business Class service. Guests enjoy dedicated priority airport services, free lounge access, an extra baggage allowance and Millemiglia members can earn miles based on the distance flown. Redesigned cabins and an enhanced catering service depending on flight time allow guests to be immersed in Italian hospitality from takeoff to landing. 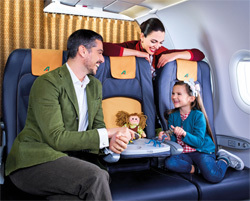 Visit www.alitalia.com to learn more about Medium Haul Business Class and plan your trip today! Sign up for our newsletter today and be kept up to date on Alitalia’s latest news and special fares!